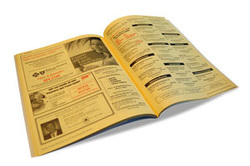 Advertising - Central Florida Directories inc.
CFD Yellow Pages–the perfect way to reach retirees. Reach over 30,000 residents through our EXCLUSIVE directories! While traditional yellow pages have seen their popularity decline in recent years, CFD Yellow Pages have thrived. Why? It's simple. The residents have a connection with their community's directory that just doesn't exist with traditional, county-wide yellow pages. And they USE these yellow pages. Let's face it, the younger generation has grown up using the internet for all their references, and all their friends have unlisted cell phone numbers. Not so with retirees. They are accustomed to using phone books and yellow pages for reference. CFD Yellow Pages are more user-friendly, designed with retirees in mind. We use larger fonts and carefully selected advertisers. That translates to more effectiveness for ads, which explains our 90% renewal rate for advertisers year after year. For Marion County books: reserve space by 1/10 for publication by 3/1. For Lake County books: reserve space by 6/10 for publication by 8/1. Please contact us for current rates. (352) 861-6368.